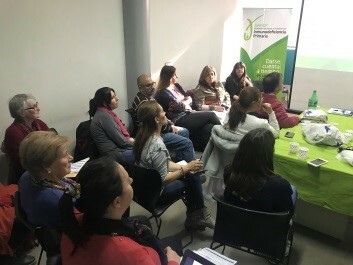 AAPIDP, the Argentinian national PID patient association, held its third Regional Patient Meeting in Mendoza City, entitled “Let’s talk about Primary Immunodeficiencies”, with Mrs Roberta A. de Pena and Mrs Fabiana Monteagudo participating on behalf of AAPIDP. 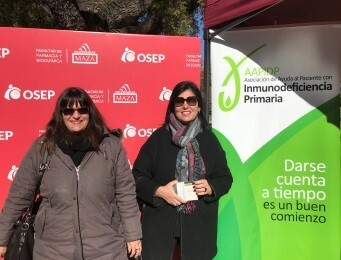 Dr Elma Nievas from Alexander Fleming Hospital and Dr María Gloria Rivero from Central Hospital were present, representing the medical community. The meeting started with the attendants introducing themselves, followed by a presentation about AAPIDP’s work. There was a presentation about legal aspects, such as: educating patients about their rights, access to medication, types of coverage, how the right to health is guaranteed, how to handle the paperwork, disability certificates, rare diseases’ law, transplant law, medication prescription, medication coverage, health insurance, etc. All these topics were of paramount importance to the patients and the professionals, since many patients have trouble accessing treatment and care and these where very helpful tools. Patients had the opportunity to ask medical questions to the attending physicians about vaccination, health care, types of immunoglobulin, administration routes, autoimmunity issues, transition-related questions, etc. On the same day, Mrs A. de Pena and Dr Nievas, together with Executive Director of the Argentine Rare Diseases Federation – FADEPOF – had a meeting with the Health Subsecretary Dr Oscar Sagás, to present the work of FADEPOF and to propose a joint work plan for rare diseases in Argentina. The meeting was very positive and AAPIDP is now waiting for an answer from the Ministry. We thank Grifols Laboratory for their help holding this meeting in Mendoza.